Draft: 2008, Cincinnati Reds, 1st rd. Married Amber … has two children: Troy and Marie … sister, Yainee, is married to major-league All-Star Manny Machado ... Twitter: @YonderalonsoU … Instagram: @yonder2323 ... Was born in Cuba and moved to the United States when he was 10 with his father, mother and sister … his father played and coached for the Industriales club in Cuba ... Attended the University of Miami (Fla.), where he batted .347 with 52 home runs and 215 RBI over three seasons … was a Baseball America First Team All-America selection as a junior in 2008 and a Second Team pick as a sophomore in 2007 ... Is a 2005 graduate of Coral Gables (Fla.) High School, the same school that produced former major-league third baseman Mike Lowell … was a two-time All-State selection ... Was drafted by Minnesota in the 16th round of the 2005 draft but did not sign. Ranked second among American League first basemen in RBI (81) and third in OPS (.738) in his only season with Cleveland … his 23 home runs were the second-highest total of his career (28 in 2007) ... Made 131 starts at first base … batted .288 (40-139) with runners in scoring position and .361 (26-72) in 19 games vs. the White Sox ... Hit grand slams on 3/31 at Seattle and 6/22 vs. Detroit, the third and fourth of his career ... Homered in a career-high three straight games from 4/26-28 … drove in a run in four consecutive games from 5/26-29 ... Batted .302 (26-86) with six home runs and 21 RBI over 23 games in July … matched his career high with four hits on 7/1 at Oakland … hit two home runs on 7/21 at Texas and 8/24 at Kansas City, upping his career multi-homer game total to five ... Went 17-43 (.395) with a double, home run and six RBI over his last 13 games, upping his average from .237 to .250 ... Appeared in two games of Cleveland's ALDS loss to Houston. Had a career season in 2017, earning his first A.L. All-Star bid while hitting a career-high 28 home runs after entering the season with 39 career homers over his first five campaigns...Also recorded career-bests in runs, walks, RBI and all the ratio stats (OBP/SLG/OPS)...Hit 7 homers in 532 plate appearances in 2016 with Oakland that shot up to 28 in 521 plate appearances between Oakland and Seattle in 2017... Finished 12th in the American League in on-base pct. (.365) and 17th in OPS (.866)...Traded by Oakland on August 6 to the Mariners for OF Boog Powell...At the time of the trade ranked 10th in the A.L. in OPS (.896)...All three of his career two-homer games came with OAK in 2017. Has 22 home runs with Oakland were the most by an A's first baseman since Jason Giambi hit 32 in 2001 as a first baseman…17 of his 28 home runs came in spacious ballparks in Oakland and Seattle (.936 OPS in home parks; .805 in road parks)...His .500 (34/68) average on the first pitch was 3rd-best in the league...Hit a career-high 10 home runs in May, batting .303 (30/66) for the month with an A.L.-high 10 HR, 17 RBI and a 1.228 OPS...Named A.L. Player of the Week for the first time in his career for the week of May 7...Batted .282 (107/379) off RHP with 23 HR (.383/.517/.900) and .181 (13/72) off LHP with 5 HR (.263/.417/.679)... His .900 OPS ranked 11th-best among American Leaguers vs. RHP. Belted a game-winning home run off New York's Aroldis Chapman in the 11th inning on August 25 at Yankee Stadium and is one of 2 left-handed batters to homer off of Chapman since 2012...His 25 home runs in the 4th inning or later ranked T9th-most in the Majors. Batted .253 with 34 doubles, seven home runs and 56 RBI in 156 games in his first season with Oakland…had career highs in games and runs scored (52)…had the fourth lowest slugging percentage (.367) and OPS (.683) in the American League…ranked second among AL first baseman with a .9967 fielding percentage (4 errors in 1229 chances)…that was the second best fielding percentage by a first baseman in Oakland history (McGwire's .9969 in 1991) and fourth best in Athletics history (Power, .9981 in 1957; Foxx, .9975 in 1935)…his 145 games played as a first baseman tied for seventh most in Oakland history…now has a .997 fielding percentage over the last four years, which is the best in the majors among first basemen with 350 or more games played…made 118 of his 133 starts against right-handed pitchers…batted .257 (107-for-416) with six of his seven home runs against righties, .227 (15-for-66) against lefties…has made 264 of his 299 (88.3%) starts over the last three years against righties…hit .302 with six of his seven home runs with runners on base compared to .217 with the bases empty…has hit 19 of his 39 career home runs with runners on base…went 7-for-11 (.636) with 13 RBI with the bases loaded…the batting average was the best in the majors and tied for third best in Oakland history…hit .282 on the road, .218 in Oakland…slugged all seven of his home runs at night and 18 of his 19 home runs over the last three years have come under the lights…his seven home runs were third fewest in Oakland history among players with 400 or more plate appearances as a first baseman…they are the fewest since Bruce Bochte had six in 459 plate appearances in 1986…had one home run and 18 RBI over his first 74 games, six home runs and 38 RBI over his final 82 contests…went 2-for-10 (.200) with two doubles and four RBI as a pinch hitter…tied for second among AL pinch hitters in doubles and tied for fourth in RBI…ranked sixth in the AL with a line drive percentage of 27.9…went 5-for-7 (.714) in extra innings and is a .324 (11-for-34) career hitter after the ninth inning…started games at every spot in the order except first and fourth…led the A's with 36 starts from the eight spot. Batted .282 with five home runs and 31 RBI in 103 games in a season shortened by two stints on the disabled list…the batting average was his best in his four seasons with San Diego, as was his .361 onbase percentage and .742 OPS…scored a career-high 50 runs and his 103 games played were the second most of his career…batted .287 (80-for-279) against right-handed pitching compared to .267 (20-for-75) against left-handers…hit .309 with a .407 on-base percentage on the road, .254 with a .309 on-base percentage at Petco Park…batted .299 when leading off an inning…had a .203 batting average with runners in scoring position…four of his five home runs were solo shots and four came with two outs…hit .323 against National League West competition but batted just .188 in interleague play…was successful in just 2-of-7 (28.6%) stolen base attempts…was 15-for-16 (93.8%) in his career entering the season… started a team-leading 92 games at first base and committed just three errors in 102 games overall at first for a .997 fielding percentage…also made two starts third base…was 2-for-3 (.667) with a double and a walk as a pinch hitter…started games in every spot in the order except eighth and ninth and saw his most action with 47 starts batting fifth. Appeared in 84 games for the Padres, missing time due to a right wrist injury...Made his third career Opening Day roster, starting at first base in the Padres season opener for the third-straight year on 3/30 vs. LAD...Missed 30 games from 6/17-7/26 on the 15-day DL with right wrist tendinitis…also missed 43 games from 8/13 until the end of the season with a strained right forearm...Activated from the 15-day DL on 7/26 and hit .421/.477/.737 (16- for-38) in 15 games before being placed back on the DL on 8/13...Appeared at third base three times, once on 4/17 vs. COL (1.0 inn. ), 5/3 vs. ARI (1.0 inn.) and 6/2 vs. PIT (1.1 inn. )…recorded one assist in his only defensive chance at the "hot corner. "...Over his final 23 games at Petco Park from 5/9-8/12, hit .308 (20-for-65)…hit just .183 (11-for-60) over his first 20 home games...Over 27 games during the month of May, hit .267 (23-for-86) with four home runs and 12 RBI...Tallied four multi-double games, the second-highest total among Padres players, trailing only Rene Rivera's five...Belted the game-tying solo home run off Rafael Soriano with two outs in the ninth inning on 6/7 vs. WSH…according to ELIAS, it was the first time a Padres player hit a lead-changing home run with the team down to its final out of a home game since 2009 when David Eckstein and Adrian Gonzalez both did it against Arizona...Recorded a walk-off RBI fielder's choice on 5/4 vs. ARI to score Cameron Maybin from third…it was his second career walk-off plate appearance, joining his game-ending single on 9/16/12 vs. COL.
Set a career-high by hitting .281 (94-for-334) in 97 games...Made his second career Opening Day roster and second-straight,start at first base in the season opener on April 1 at NYM...Placed on the 15-day DL on June 6 with a right hand contusion (retroactive to June 1)…reinstated on July 12 after playing in four games on a rehab assignment with Triple-A Tucson...Hit all six of his home runs prior to his DL stint...slugged .416 from April 1 - May 31 and just .306 after being activated from DL...Opened the season hitting .292 (28-for-96) with 16 RBI in 26 games during the month of April...Tied a Padres club-record (multiple times) and a personal career-high with three doubles on April 27 vs. SF, his second career three-double game (also July 30, 2012 at CIN)...Made 15 starts batting third in the order, hitting .308 (16-for-52) in those games…also appeared in 36 games, 35 starts, batting fourth in the order, hitting .296 (40-for-135)...Hit .296 (72-for-243) against right-handed pitchers and .242 (22-for-91) against left-handers…hit .305 (50-for-164) in 49 games at Petco Park and .259 (44-for-170) in 48 games on the road...In 40 second-half games, hit .296 (40-for-135) and drew 17 walks against 15 strikeouts for a .370 on-base percentage...Made his last start of the season on August 30 at LAD...appeared in just two games as a pinch-runner in the final month of the season on September 28-29, missing time due to issues with his prior right hand injury...Had a season-best eight-game hit streak from April 9-16 (.419, 13-for-31). Set career-highs in nearly every offensive category in his first full Major League season, including games (155), hits (150), doubles (39), home runs (nine), RBI (62), runs (47) and walks (62).Made his first career Opening Day roster in 2012, starting atfirst base in the Padres first game of the season on 4/5 vs. LAD.Led all Major League rookies in games played (155) and doubles(39) in 2012...ranked tied for second in hits (150) with NorichikaAoki(MIL) among MLB rookies and tied for the most among all NLrookies,trailing only Mike Trout (182forLAA)...also ranked secondamong MLB rookies in walks (62), behind Trout (67 for LAA).Set a new Padres rookie-record with 39 doubles, passing theprevious franchise-mark held by Benito Santiago (33 in 1987)...his 20 doubles prior to the All-Star Break were the most ever by a Padres rookie in the first half.Finished tied with Ryan Klesko (39 in 2002) for the 10th-most doubles all-time in a season by a Padre.Also set a Padres record with 10 multi-double games in 2012, the most games with multiple doubles in all of MajorLeague Baseball in 2012...passed the previous franchise-mark of six multi-double games by Tony Gwynn in 1993and Adrian Gonzalez in 2007.In 72 games after theAll-Star Break, hit .285 (73-for-256) with 19 doubles, six home runs and 39 RBI.Collected his first career grand slam on 9/14 vs. COL off Tyler Chatwood in the first inning.u Had a career-best 10-game hit streak from 5/18-27, hitting .351 (13-for-37) over that stretch.Collected two hits and three RBI in back-to-back games on 7/18-19 at HOU, becoming the first rookie in Padreshistory to do so (ELIAS).Had 13 games total with multiple extra-base hits in 2012, the most by a Padre since Adrian Gonzalez had 15 suchgames in 2007.Rated No. 33 on Baseball America's Top-100 Prospects list and No. 1 in the Padres' organization heading into the2012 season. Began the season at Triple-A Louisville, where he was an International League mid-season All-Star and played in the XM All-Star Futures Game...promoted to the Majors on 7/26 and spent the rest of the season with the Reds...named the Padres No. 1 prospect heading into the 2012 campaign by Baseball America...Joined the Reds following Jonny Gomes trade to WSH...started 14 games in left field, one at first base and one at third base...nine multi-hit games in his 16 totals starts, hitting .367 (22-for-60) with four home runs and 13 RBI in his starts...Connected for his first Big League home run 8/6 at CHI off Carlos Zambrano...Made 21 appearances at first base and 62 in the outfield for Louisville....296 average for the Bats ranked ninth among all Reds farmhands...Rated No. 73 on Baseball America's Top-100 Prospects list and No. 4 in the Reds' organization heading into the 2011 campaign. Was born in Cuba...when he was 10 years old moved to the United States with father Luis,mother Damarys and sister Yainee...Luis was a player and coach for the esteemed Industriales club in Cuba...graduated from Coral Gables (FL) High School...was drafted by the Reds after his junior season at the Universityof Miami, where he hit .367 with 23hr and 71rbi in 61 apps for one of the nation's top baseball programs...as a freshman led UM into the College World Serieswith a team-best 69 RBI...the next season hit .376 andled the Atlantic Coast Conference with 18 homers...in 2005 was drafted out of high school by the Twinsbut did not sign. In 78 games at Class A Sarasota and Class AA Carolina combined to hit .300 with 24 doubles, 9 HR and 52 RBI...missed two months while on Carolina's disabled list with a broken right hamate bone, an injury that required surgery on 6/23 (Dr. Timothy Kremchek)...was a Florida State League All-Star...produced a pair of 16-game hitting streaks for Sarasota, the second-longest streaks of the season in the FSL (17 G)...played first base for Louisville in the International League playoffs (5g, 5-20, .250, 1 2B, 1 HR, 2 RBI, 2 BB, 3 K, 2 R)...was rated by Baseball America as the organization's best hitter for average and the hitter with the best knowledge of the strike zone...following the season played for the Peoria Seguaros in the prestigious Arizona Fall League and was selected to participate in the Rising Stars showcase (23 G, .267, 2 HR, 23 RBI)...also played for Caguas in the Puerto Rican Winter League (16 G, .213, 1 HR, 6 RBI)...entered the season rated the Reds' No. 1 prospect. Began his professional career with Sarasota in the high Class A Florida State League andhit .316 in his 6 apps there...on 8/26 vs Clearwater made his pro debut, started at 1B batting third and went1-for-3 (1 2b, 1r, 1bb, 1k)...doubled off the wall in his first career plate appearance...following the seasonplayed for Waikiki in the Hawaii Winter Baseball League (29g, .308, 9 2b, 4hr, 21rbi). December 15, 2018 Cleveland Indians traded 1B Yonder Alonso to Chicago White Sox for RF Alex Call. June 18, 2018 Cleveland Indians activated 1B Yonder Alonso. June 15, 2018 1B Yonder Alonso roster status changed by Cleveland Indians. December 23, 2017 Cleveland Indians signed free agent 1B Yonder Alonso. November 2, 2017 1B Yonder Alonso elected free agency. August 8, 2017 Seattle Mariners activated 1B Yonder Alonso. August 6, 2017 Oakland Athletics traded 1B Yonder Alonso to Seattle Mariners for CF Boog Powell. December 2, 2015 San Diego Padres traded LHP Marc Rzepczynski and 1B Yonder Alonso to Oakland Athletics for LHP Drew Pomeranz, LHP Jose Torres and Player To Be Named Later. November 4, 2015 San Diego Padres activated 1B Yonder Alonso from the 60-day disabled list. June 2, 2015 San Diego Padres activated 1B Yonder Alonso from the 15-day disabled list. 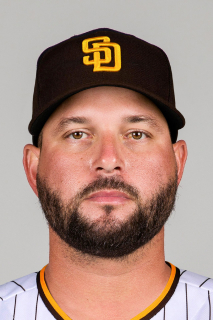 May 29, 2015 San Diego Padres sent 1B Yonder Alonso on a rehab assignment to El Paso Chihuahuas. May 27, 2015 San Diego Padres sent 1B Yonder Alonso on a rehab assignment to Lake Elsinore Storm. November 3, 2014 San Diego Padres activated 1B Yonder Alonso from the 60-day disabled list. September 1, 2014 San Diego Padres transferred 1B Yonder Alonso from the 15-day disabled list to the 60-day disabled list. Strained right forearm. August 14, 2014 San Diego Padres placed 1B Yonder Alonso on the 15-day disabled list retroactive to August 13, 2014. Strained right forearm. July 26, 2014 San Diego Padres activated 1B Yonder Alonso from the 15-day disabled list. July 21, 2014 San Diego Padres sent 1B Yonder Alonso on a rehab assignment to El Paso Chihuahuas. July 18, 2014 San Diego Padres sent 1B Yonder Alonso on a rehab assignment to AZL Padres. July 12, 2013 San Diego Padres activated 1B Yonder Alonso from the 15-day disabled list. July 8, 2013 San Diego Padres sent 1B Yonder Alonso on a rehab assignment to Tucson Padres. June 6, 2013 San Diego Padres placed 1B Yonder Alonso on the 15-day disabled list retroactive to June 1, 2013. Right hand contusion. December 17, 2011 Cincinnati Reds traded Brad Boxberger, RHP Edinson Volquez, C Yasmani Grandal and 1B Yonder Alonso to San Diego Padres for RHP Mat Latos. July 26, 2011 Cincinnati Reds recalled Yonder Alonso from Louisville Bats. July 13, 2011 Yonder Alonso roster status changed by Louisville Bats. July 9, 2011 Louisville Bats placed LF Yonder Alonso on the temporarily inactive list. March 21, 2011 Cincinnati Reds optioned LF Yonder Alonso to Louisville Bats. October 13, 2010 Yonder Alonso roster status changed by Cincinnati Reds. October 6, 2010 Cincinnati Reds reassigned 1B Yonder Alonso to the minor leagues. September 1, 2010 Cincinnati Reds recalled Yonder Alonso from Louisville Bats. May 13, 2010 Yonder Alonso assigned to Louisville Bats from Carolina Mudcats. April 7, 2010 Yonder Alonso assigned to Carolina Mudcats from Louisville Bats. March 18, 2010 Cincinnati Reds optioned Yonder Alonso to Louisville Bats. November 27, 2009 1B Yonder Alonso transferred to Criollos de Caguas from Peoria Saguaros. November 15, 2009 Yonder Alonso assigned to Criollos de Caguas. October 19, 2009 Yonder Alonso roster status changed by Cincinnati Reds. September 9, 2009 Yonder Alonso assigned to Louisville Bats from Carolina Mudcats. August 24, 2009 Yonder Alonso assigned to Carolina Mudcats from Sarasota Reds. August 22, 2009 Yonder Alonso assigned to Sarasota Reds from GCL Reds. August 4, 2009 Yonder Alonso assigned to GCL Reds. June 1, 2009 1B Yonder Alonso assigned to Carolina Mudcats from Sarasota Reds.